The first Christmas storybook by the children’s author has been reviewed by one of the book industry’s most trusted book review publications. E. Dorinda Shelley made Christmas reading fun again with “Santa’s Sleigh-Train,” her first holiday storybook. The story revolves around Santa finding a way to avert a potential Christmas catastrophe brought forth by the untimely sickness of Rudolph the reindeer, whose “nose wasn’t working right and was too dim.” With Rudolph too sick to guide the sleigh, Santa has to quickly find another way to deliver the toys to kids. The story itself doesn’t bring anything entirely fresh to the genre of picture books featuring a threat to Christmas presents being delivered on time, and in fact the solutions feel a bit too easy: Santa doesn’t try out any other ideas before he lands on the train as the best one, and the solution is never shown to have unforeseen side effects. 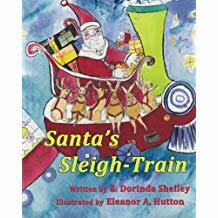 Still, the book gives young readers a chance to watch Santa problem-solve when Rudolph falls ill.
Purchase E. Dorinda Shelley’s “Santa’s Sleigh-Train” today through Amazon and Barnes & Noble. Dr. E. Dorinda Shelley is a retired dermatologist who now runs used book stores and art galleries in Grand Rapids, Ohio. This is her fourth children’s book. Illustrator Eleanor A. Hutton is a graduate of Maumee Valley Country Day School and The College of Wooster, Ohio. Ms. Hutton has previously illustrated five children’s books, authored one and co-authored another.